JRP Services can pressure wash and restore & rejuvenate any type of flat surface to remove unwanted grease, oils, dirt, soot and gum from sidewalks, trash enclosures, parking structures, courtyards, homes, and office buildings. We can pressure wash all types of natural stone, vinyl, concrete, brick, metal, wood and sidings. Also available - roof tile pressure washing, cleaning and sealing. 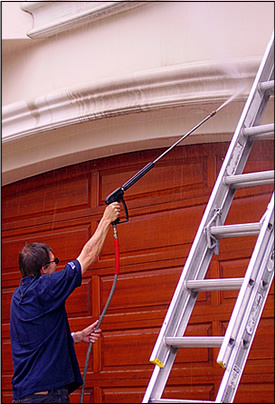 JRP Services also pressure washes all vertical surfaces to improve the appearance of buildings. pressure washing is safe and can be done hot or cold. please call for your free pressure washing bid or to schedule your next pressure washing service.